Six Master Classes will be organized in order to provide practical basic know-how on how to use the most common monitoring systems. 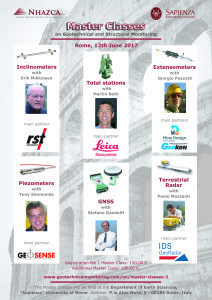 The courses, with a duration of 2:30 hours, will be held by one leading international expert on the 12th June 2017, the day before the beginning of the 3-days course (13-15 June, 2017). Each class will cover the following main topics: installation, data acquisition, data processing, tricks and tips from everyday experience. 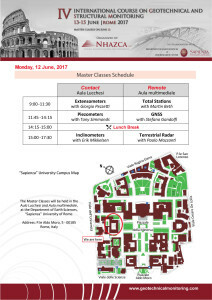 The Master Classes will be organized in connection with the International Course on Geotechnical and Structural Monitoring, but will be open also to people that will not attend the full Main Course. Each Master Class will be activated to the achievement of the minimum number of 10 registrants.